This amazing six ingredient White Hot Chocolate is just what you need to take the chill off and it comes together in about five minutes! With a little bit of colorful sprinkles you can dress this up for any occasion. This is the time of the year for all things festive, fun and chocolaty! Has old man winter entered your neck of the woods? Is Jack Frost nipping at your nose? He seems to be coming in fast and furious here. Hubby told me that our favorite weather man has predicted a white Christmas. 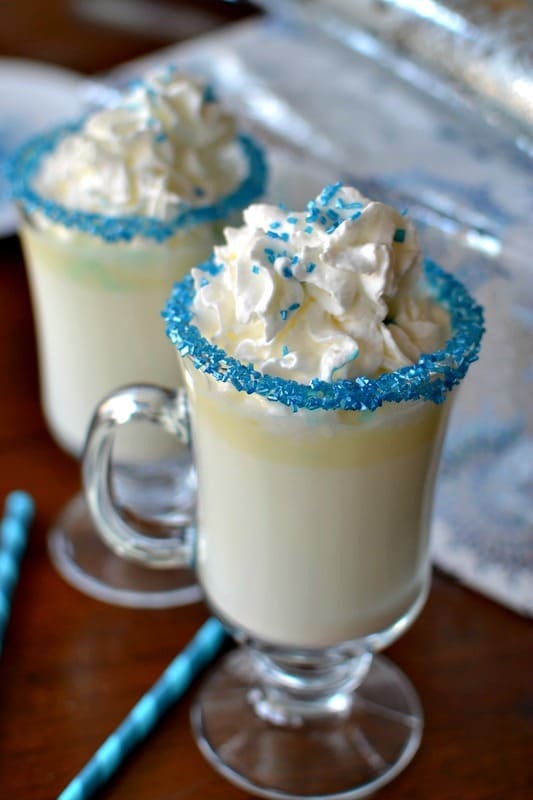 This amazing Winter Wonderland White Hot Chocolate is just what you need to take the chill off. This six ingredient hot chocolate comes together in about five minutes and is so much better than Starbucks! It is only three ingredients if you forgo all the fluff but I like the fluff. The pretties make it look so festive and fun. You want to kick it up a notch for the adults mix in a little bit of vanilla schnapps. This could not be any easier. First heat your milk, half n half and white chocolate chips over low heating whisking frequently. You don’t want the milk and half n half to scald so keep the heat down low. Dip your finger in a little corn syrup and run the rims of the glasses. Place sprinkles on a shallow plate and run the rims of the glasses through the sprinkles. 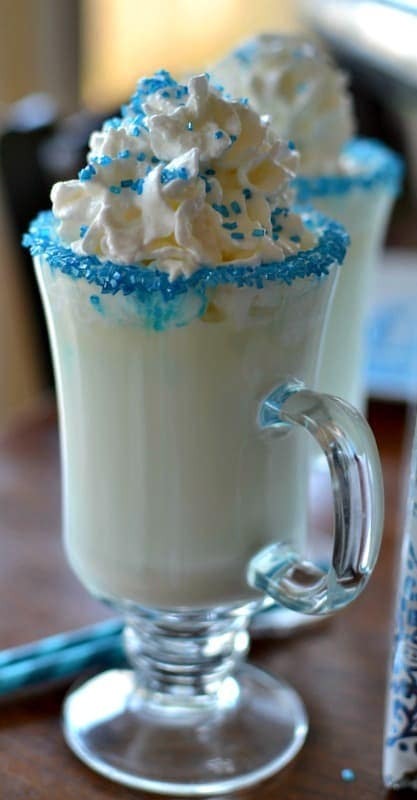 Pour the hot chocolate into the glasses, top with whipped cream and more sprinkles. Serve as soon as possible. 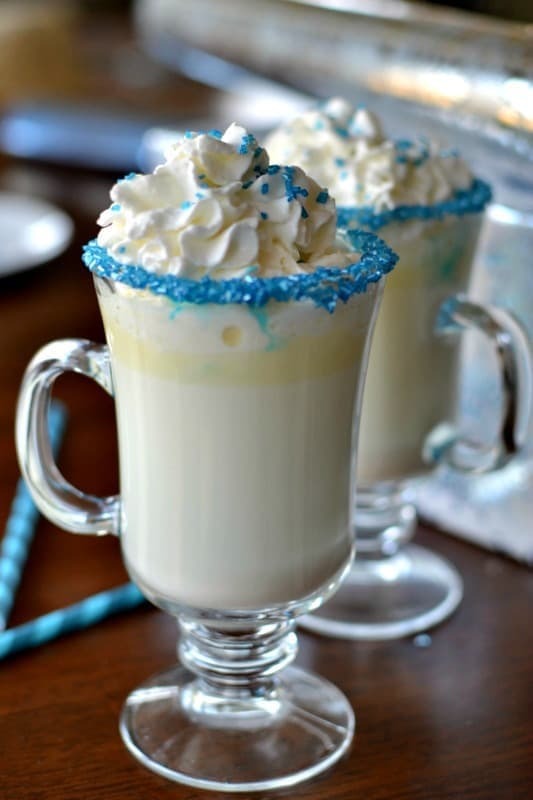 How to serve White Hot Chocolate for a party. Are you doing any entertaining this holiday season? These would be the perfect treat to greet your guests with when they arrive at your party. Are you having a large party? Prepare it and place it in a crock pot on low and have already prepared mugs, matching straws, sprinkles and of course whipped cream. You can purchase those cool wraps for the whipped cream cans. Keep an extra can of whipped cream or two in the fridge and switch them out every thirty minutes or so. 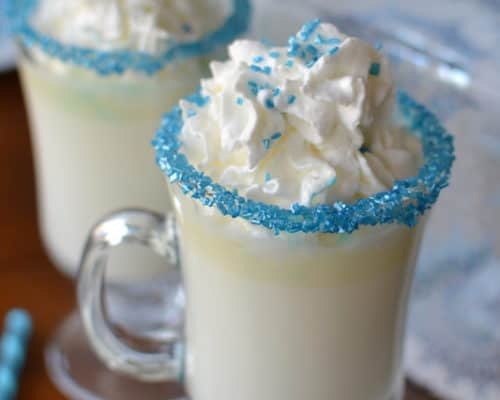 This fun and festive Winter Wonderland White Hot Chocolate recipe is perfect for family movie or game night. Think how wonderful these would taste after a day of playing in the snow. Of course I think anytime is a great time to indulge in hot chocolate. What do you think? 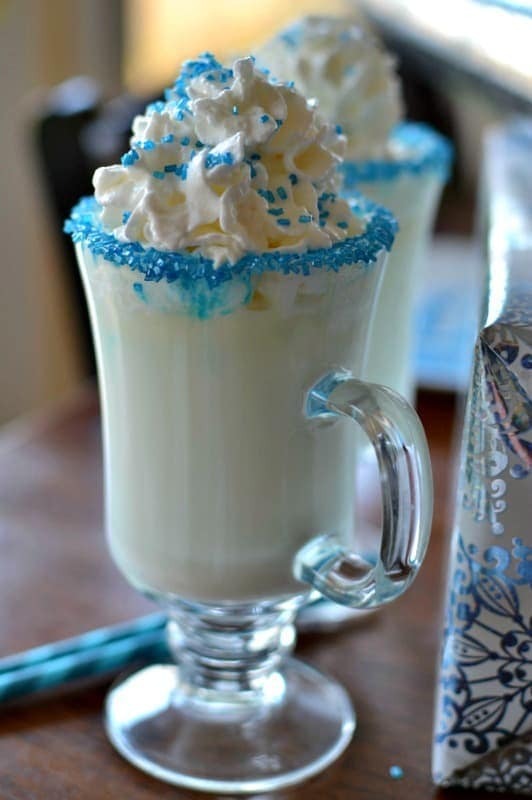 Other fall and winter beverages you will love! This post was originally published December 3, 2017 and was republished October 11, 2018 with new relevant information. This amazing six ingredient White Hot Chocolate is just what you need to take the chill off and it comes together in about five minutes! In a saucepan over low heat add half n half, milk and white chocolate chips. Whisk frequently and do NOT allow to boil. Continue whisking until the chocolate is melted and the mixture is hot. Pour some sprinkles on small shallow plate. Rim mugs with a fingertip of corn syrup. Dip rims in sprinkles and twist to coat. Fill mugs with hot chocolate, top with whipped cream and sprinkles. Yes it is so delicious! Thanks for stopping by! Half n half is a simple blend of equal parts whole milk and light cream. If you live in the United States you can purchase it already mixed at the grocery store. Thanks so much! So glad that you liked it! This looks divine. We’re going sledding tomorrow and then I want to try making this! Thanks so much! Have fun sledding!